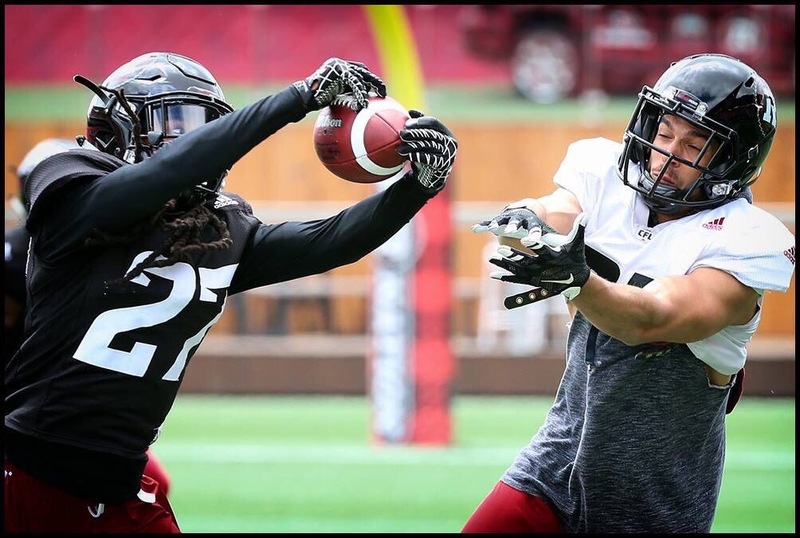 In the second episode of the Carleton Ravens Football Podcast, Jeff welcomes another former Raven in FB Stefano Napolitano (2013-17). Stefano shares a few memories from his time at Carleton, including being part of the rebirth of the Ravens football program in 2013 and the remarkable Panda Game victory in 2014. We also hear about Stefano’s experience playing pro football In Italy, with Rhinos Milano in the Italian Football League (IFL). Certainly topical, with the CFL’s “2.0” global initiatives having kicked off in recent months. In the episode’s Mount Rushmore feature, Stefano joins Jeff and they each provide their four best players from the first five years of the re-launched Carleton Ravens football program. Carleton Ravens alumnus and Ottawa media mogul Jeff Morris records the pilot episode of the Carleton Ravens Football Podcast – literally while on the road! Jeff sets up the format for the show; Memories from his CFL draft evaluation (precursor to the combine) experience in Vancouver in 1984; Talks about the Junior Ravens football program; A look back at the 1976-1980 Carleton Ravens football teams, recently honoured at the school’s football banquet; This week’s Mount Rushmore looks at the four former Carleton Ravens who had the best CFL careers. Tarps Apparel Co. is a Hamilton-based apparel company whose line of premium t-shirts celebrate several of the Canadian Football League’s legendary athletes, characters and moments. Co-owner Chris Hyk was nice enough to join us for a chat and give us a little of the back story behind this really cool venture. Tony Gabriel “The Catch” t-shirt by Tarps Apparel Co.
@DefendTheR: Let’s start with a little background. 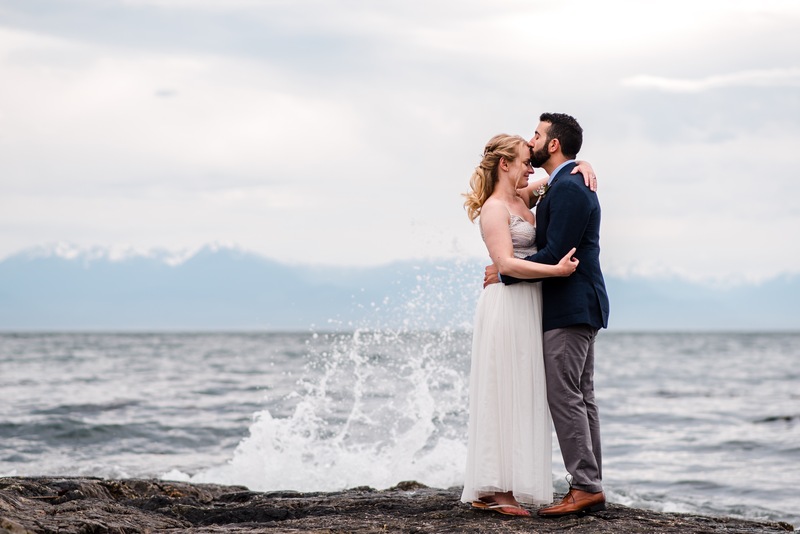 How’d you get started and how long have you been in the apparel business? Chris Hyk: 2018 was the first year of Tarps Apparel. I am an elementary school teacher, and am learning more and more as we go about the apparel business. My partner, Corey Stringer, comes from a background in the sports apparel industry, and we followed his lead throughout our initial season. We had a successful first year and are gaining momentum heading into our second year of a three-year deal with the CFL Alumni Association. Angelo Mosca “1972” t-shirt by Tarps Apparel Co.
Angelo Mosca portrait t-shirt by Tarps Apparel Co.
What’s the story of your CFL fandom? Ticats fan, I assume. I am a lifelong CFL and Ticats fan, and season-ticket holder, thanks mostly to my father working for the Cats in the 1980s and ’90s in a number of roles, including being responsible for creating team-branded merchandise. Coincidentally, dad also worked for the Ottawa Rough Riders organization during the 1995 and ’96 season. Corey and I both attend all the home games here in Hamilton and thoroughly enjoy ourselves. The atmosphere these past few years at the new Tim Hortons Field has been particularly fun. It’s a really exciting time to be a football fan here in Hamilton, and across the league for that matter. George Reed “RB” t-shirt by Tarps Apparel Co.
George Reed portrait t-shirt by Tarps Apparel Co.
Where did the concept for Tarps Apparel originate? What was the process like to team up with the CFLAA? The concept for our apparel line comes simply from us being very interested in the stories of these legendary CFL athletes. We were intrigued with the idea of how we could bring the stories of these legends back and introduce them to a younger crowd of football fan who didn’t get a chance to watch and follow them in their time or really understand and appreciate what these names mean to their cities. We want fans to understand the men who came before, who paved the way and who made football in that city what it is today. These legends poured their soul out for the game and their city, and did it with pride. We want both new and old fans to understand and appreciate these guys the way they deserve. And delivering that on a high quality, bamboo vintage tee seemed like the perfect marriage. The CFLAA and their president Leo Ezerins have been very supportive of our cause and have been nothing but helpful in the process. Henry Gizmo Williams “Gizmo” t-shirt by Tarps Apparel Co.
Henry Gizmo Williams portrait t-shirt by Tarps Apparel Co.
Looks like you guys make some real high-quality shirts. Tell us about that and why it fits with your brand. The use of a high-end tri-blend bamboo tee was conceptualized to allow fans to show their support of a legend and show pride for their city anywhere they go. Be it at the game, out with the boys (and girls) or enjoying drinks on a patio far away from the stadium, the shirts allow you to show hometown pride in a very subtle and fashionable way. Our focus was not so much on the football organization, but rather the player and the city they fought for. We actually developed our own specific cut for the shirts, as we wanted a more athletic fit suitable for any occasion. This shirt is of the highest quality and comfort, and has a vintage, distressed feel that makes you not want to take it off. Both Corey and myself valued this quality, and we’ve gotten excellent feedback from our customers. We’re extremely proud of the way they turned out, and are continuing to tweak with new styles for next season. Chris Walby “Nine-time All-Star” t-shirt by Tarps Apparel Co.
You mention on your site that the sale of each shirt supports the players themselves. Without getting into any financial specifics, how does that work? Our deal pays the CFL Alumni Association annually, as well as each player we deal with receiving a portion of sales for his shirt. With the backing of the CFLAA, we were able to work closely with each player – a surreal experience for me growing up as a fan and being able to watch many of our athletes compete firsthand as a kid – in establishing artwork, styles, etc. Designs are approved by the guys themselves. I vividly remember the first time I was able to speak with my childhood hero, Earl “The Pearl” Winfield about designing his shirt. It gave me goosebumps, and was an experience that I won’t forget. It reaffirmed my love of the idea and why we had started this project in the first place. Earl Winfield “Earl the Pearl” t-shirt by Tarps Apparel Co.
How did you determine which guys to include in the line? We worked closely with Leo (Ezerins) and the CFLAA in establishing a gameplan and an identity. We wanted players that left their mark on the team and the community. We also spoke to fans in each community to gain an understanding of which players they felt had the biggest impact in each community. We are happy with the names we chose for the first year, and are continuing to make connections with other players, getting them on board for this upcoming season. Lui Passaglia “Lui” t-shirt by Tarps Apparel Co.
Lui Passaglia portrait t-shirt by Tarps Apparel Co.
Lots of big personalities in the players you’re working with. Any fun stories you can share? Seeing the area codes calling my phone, hearing “Hi Chris, its Lui Passaglia”, emails back and forth with Chris Walby, chatting with Paul Osbaldiston about some of his favourite moments as a Ticat… All of these things made me feel like a 10-year-old fan again, sitting in the bleachers, eating a hot dog and wearing my favourite foam Tiger Paw. It’s an incredible position we are in to get to connect with these players, to talk football and to be able to share their stories with fans of all generations. It’s a very humbling experience! Paul Osbaldiston “Ozzi3” t-shirt by Tarps Apparel Co.
What have the player’s reactions been like to the final product? We have received very positive feedback from the guys! Everyone has seemed to be impressed with the designs and the quality of the product. We feel it’s a very unique angle in today’s athletic apparel industry, and the guys have agreed. We are very happy with the results thus far! Tony Gabriel portrait t-shirt by Tarps Apparel Co.
Tony Gabriel is obviously a member of Ottawa football’s Mount Rushmore, but also won a Grey Cup in Hamilton. What was the thought process in including him in your line? Tony was an excellent player in both cities, but the idea behind his shirt was of course capturing that incredible moment in time. A play that brought an entire capital city together, and converted many people across the country into Rough Riders fans. Tony’s “The Catch” is synonymous with Ottawa football, and a play that will live forever. It is symbolic of the stamp he left on the game, and a very proud moment for Ottawans. Peter Dalla Riva “1977” t-shirt by Tarps Apparel Co.
Peter Dalla Riva portrait t-shirt by Tarps Apparel Co.
What’s next for Tarps Apparel? Will there be a new series coming for the 2019 season? Any details you can share about it? We are currently working with new players, creating new designs, and looking at possibly venturing into other sports markets. Both Corey and myself come from hockey backgrounds (playing junior A hockey here in southern Ontario and still both being very involved in the hockey community here in Hamilton) and would love to eventually work with some legends of the NHL. But we are focused on promoting the stories of many more legendary CFL athletes this season! On behalf of CFL fans, thanks for this great initiative and making sure these incredible athletes continue to get the recognition they deserve. We’re very proud and humbled to being working so closely alongside this great game, the men themselves, and the city’s and communities they represented. Were very excited for what the future holds! Thank you again for supporting and sharing our vision and respect for this great league and its fans! Check out Tarps Apparel Co. on Twitter and visit their website at www.tarpsapparel.com. Follow us on Twitter at @DefendTheR. Editor’s note: Our friend, fellow CFL fan (Saskatchewan, but try not to hold it against him) and favourite uniform concept designer Nelson Hackewich was kind enough to share some of his thoughts and experiences at this year’s Grey Cup Festival in Edmonton. This is the second of two recaps on all the great stuff the festival had to offer. (here’s the first) Thanks Nelson! Super jealous! Saturday started with the traditional Calgary pancake breakfast and the Grey Cup parade. A little underwhelmed watching the parade, so when the ‘Rider contingent walks by, I step off the sidewalk and join the parade! After the parade, we all head over to the TSN booth to see the live hits of Grey Cup Saturday. While stopping inside to warm up we bumped into the legend, Pinball Clemons. And of course made the TSN coverage. When the Redblacks players were asked about the conditions of the turf, most said they were used to it, as they play on a similar surface at home. Calgary will already make history tomorrow, playing in a team-record third Grey Cup in a row. Last teams to play in three GCs in a row? Montreal 2008-10, Hamilton 1984-86, Edmonton 1977-82, Montreal 1977-79. The Redblacks are playing in a Grey Cup for the third time in the last four years, a first for any Ottawa club since the late ’60s (1966, ’68 & ’69). This will be the fourth time Calgary and Ottawa have met in a Grey Cup, with Ottawa winning in 1968 and 2016, while Calgary won in 1948. Dave Dickenson is looking for his first Grey Cup as a head coach, and trying to avoid becoming the first head coach since 1956 to lose three Grey Cups in a row. Rick Campbell looks to get his second Grey Cup. He would become the 20th head coach to win multiple championships. Calgary holds a 7-1-2 regular season edge over Ottawa since 2014; Ottawa has the 2016 GC win, however. Calgary outscored Ottawa 51-17 – with the gap (+34) made up of points off of Turnovers primarily (26 of Calgary’s 51 points). Trevor Harris did not complete either game and has passing totals of 135 and 93 yards with 3 INTs and 0 TD passes. Bo Levi Mitchell passed for 251 and 166 yards with 3 TDs, 3 gains of 30+ yards and one INT. Don Jackson rushed for 186 yards (Max 102) on 30 carries for one TD. William Powell had 140 yards. Game day was full of generally a pro-Ottawa crowd, with CFL fans in sight from morning breakfast across the street at the hotel to the train to the stadium. Arriving at the stadium at about 1:30pm (three-and-a-half hours before kickoff), we took in some of the tailgate parties, then headed into the stadium to walk about. Two hours prior to kickoff it was a balmy 2° and the field conditions looked absolutely perfect. The Redblacks took the field for warm-up to a thunderous ovation, while it seemed the Stamps were only backed by those from Calgary and some die-hard western Canadian types who dislike our current prime minister. The Reklaws belted out “Long Live the Night” and with an iconic Snowbirds fly-over, Grey Cup 106 was under way! The game wasn’t much to write home about until Terry Williams had a record 97-yard punt return touchdown on a now slippery Commonwealth Stadium field, sending Stamps fans into a frenzy. If you watch the highlights, the most impressive part of the return (besides his speed on ice) is the fact he almost fell on his own. No doubt an absolute game-changer. In the end, Bo Levi Mitchell and the Stamps got the monkey off their back, outlasting the Redblacks to win the Grey Cup. Overall, Edmonton knows how to throw a party! From the street festival, to the $300k+ 50/50 jackpot, to meeting old friends and making new ones, there was tons of great CFL and Grey Cup buzz all week long, as it should be. Can’t wait for Grey Cup 107. See you next year, Calgary! Follow Nelson on Twitter at @NelsonHackewich. Editor’s note: Our friend, fellow CFL fan (Saskatchewan, but try not to hold it against him) and favourite uniform concept designer Nelson Hackewich was kind enough to share some of his thoughts and experiences at this year’s Grey Cup Festival in Edmonton. This is the first of a couple recaps on all the great stuff the festival has to offer. Thanks Nelson! Super jealous! It was a lengthy eight-hour drive through the frosted Canadian prairie from Regina to Edmonton, which gave me a lot of time to think about who to cheer for this Sunday in the 106th Grey Cup. People will tell you, “you’re from the west how can you not cheer for the west?”, or “the cup has to stay in the east!” But, over the course of the drive, I’ve come up with a few reasons which determined that, although I primarily bleed green, for one weekend in November, I’ll cheer for the Ottawa Redblacks. Reason #1: Rick Campbell. He’s just a darn decent dude! Back when CFL Week was in Regina, I bumped into Rick almost daily in the Tim Hortons line at Evraz place, where we talked football and his love for Saturday Night Live. Plus, he is linked to not only the Riders, but the Eskimos through his father, the great Hugh Campbell. Reason #2: The increasingly popular CFL adage of ABC – Anyone But Calgary. I think Stampeders coach Dave Dickenson hit the nail on the head in his West Final post game comments when he told reporters that Canada doesn’t like seeing them in the Grey Cup. Edmonton has definitely come alive as the hotbed of Canadian football. Everywhere you look it’s decorated businesses, “Grey Cup” food and drink specials and the like. The city is roaring and ready to go! Everywhere you go people are dressed in all 10 CFL team (including the Atlantic Schooners) jerseys and apparel. Bars and restaurants are full and on American thanksgiving, where the NFL generally holds the spotlight, it was almost non-existent as the conversation turned to who is going to win on Sunday. I even heard a conversation about the Las Vegas Posse and Shreveport Pirates. A smaller crowd strolled the street fest today taking in activations from Shaw (where you could sit in a Redblacks locker stall donning Brad Sinopoli’s jersey and equipment), get some s’mores compliments of TSN, or “Take a Kick at the Can” and see if you can last 8 seconds on a giant can of Twisted Tea (Mechanical bull style). Our night was capped at the outdoor street stage where Winnipeg’s The Watchmen played all their hits! Daniel Greaves (lead vocals) came out in a retro Bombers sweater and opened by stating “I wish the Bombers were here” and closed by asking the crowd “Who are we cheering for on sunday” with a primarily pro-Ottawa response. Team hospitality rooms open up Friday with the highly anticipated announcement of the Atlantic Canada franchise team name, the CFL fan state of the league, a dip into the Shaw conference center to check out more fan fest activities, performances by Maestro Fresh Wes and Canadian supergroup Toque, capped off by a stop in Riderville and back to the stage to catch The Strumbellas. After a quick autograph signing with Saskatchewan WR Namann Roosevelt and Argos WR SJ Green, Canadian hip hop legend Maestro Fresh Wes, Dressed in a special edition Eskimos Damon Allen jersey custom made for the 2018 Grey Cup, got our day going belting out “Let your backbone slide”. Taking shots at current Canadian rap superstar Drake, saying “I’ve been doing this since he’s been on Degrassi” was classic. Wes was followed up by Canadian super group and cover band Toque, featuring Todd Kerns (Age of Electric) Brent Fitz (Slah, Myles Kenedy, Alice Cooper) and Cory Churko (Shania Twain, Live), who played nothing but hits from Loverboy, Streetheart, Chilliwack, and Queen City Kids. True Canadiana and very fitting for the Grey Cup festival. From there a dip into the Atlantic Kitchen Party for the 10th franchise name unveiling. Seriously, is anyone shocked? There were rumblings early in the week from a few of my media contacts in the league that it would be such. If the Schooners weren’t called the Schooners, it would be crushing not only to the people that host the Atlantic Schooners Kitchen Party year after year, but all of the people that have dreamt of this moment for so long. The font they chose was an interesting “UA Falcon”, which is primarily used by Under Armour teams. Using a white font on a grey stormy background also leaves a lot to be desired. Will they be black and grey? Will they be black and gold? The night was capped by visits to the #RNation Party, where we bumped into the lovely Redblacks Cheer team, Winnipeg RB Andrew Harris and Ottawa mascot Big Joe (and his forearms). Then a short walk down street fest to Riderville, where we saw performances by the BC Felions dance team, the Alouettes Cheer team and Rider Cheer team. Saturday, we take in the Grey Cup parade, team walkthroughs at Commonwealth Stadium, a tour of the Oilers beautiful Rogers Arena, and cap the night with a performance by Tim Hicks. Can’t wait! 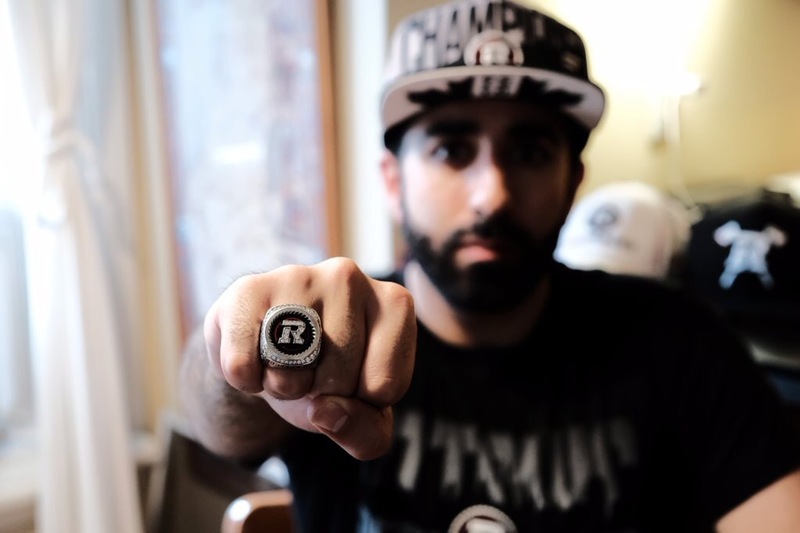 As has become pretty much an annual affair, we sat down with the man behind @Redblacks recently for a chat. Tyler Rabb is OSEG’s “Growth Hacker” (his official title), taking over from Mat Smith, who moved on following last year’s Grey Cup. Tyler shared a bit about himself, his road to a communications/social media career in sports and experiences behind the scenes with the Redblacks. @DefendTheR: Let’s start with your background. From Ottawa originally? @tylerjrabb: My younger years were somewhat divided between a few small towns around Ottawa. My family eventually moved into the “big city” just in time for me to start high school. Looking back it was nice to have the opportunity to experience both lifestyles. Once in Ottawa, I played football with the Canterbury Mustangs (NCAFA) and rugby at Hillcrest High School. After high school, I had no idea what I wanted to do. I decided to travel and took some random jobs along the way, including: tree planter in northern Ontario, cook at an oil sands camp in Alberta, and bartender at various establishments around Ottawa. At 25, I finally found something that caught my attention: Advertising. I was intrigued by the creative side of the industry, as writing had always been a strength of mine. I graduated from Algonquin College with an advanced diploma in Advertising and Marketing Communications Management. When and how did you end up with OSEG? Throughout my time at Algonquin, I realized I wanted to become a content creator in the sports world. The final part of completing my program was a six-week internship, and it was sports or nothing for me. Little did my professors know, I only applied to two organizations; the Ottawa Senators and OSEG. The internship at OSEG turned out to be the perfect opportunity, as it’s main role was to create content for all our teams’ (Ottawa Fury FC, Ottawa 67’s, and REDBLACKS) websites. My six-week internship turned into a six-month contract, which turned into a full-time career in October 2015. I owe a lot to Will Renaud and Mat Smith. The latter you know very well. The former, OSEG’s web guru (unofficial title), gave me the internship and was instrumental in my contract and full-time hire. They’ve both taught me many valuable skills that continue to serve me well. Just before Mat left OSEG in December, he handed me the keys to the REDBLACKS social channels. They were and continue to be huge shoes to fill, though Mat’s creativity and work ethic inspire me to get better everyday. Not only am I entrusted with our social channels, but I also manage web content and contribute to email communications for all of OSEG’s properties. What is your history as a CFL fan? Any favourite moments? I wasn’t a big CFL fan growing up, though I remember attending an Ottawa Renegades game with my dad in the early 2000s. The rowdy crowd and exciting game action was infectious and created an interest in football and the league. I still have trading cards of Kerry Joseph, Josh Ranek and Pat Woodcock. The athletes. Don’t want to sound like a “fanboy”, but growing up you idolize them. You play them in video games, hang their posters on your wall, memorize their stats. Working with them every day though, you realize they really are just people like you and me. Give us a couple of highlights from your tenure so far at OSEG – on-field or off. Winning the Grey Cup last November has to top the list. I was right alongside Mat on the bench at BMO Field when we took down the Stamps in OT. Being on the field and in that locker room afterwards with the champagne and cigars still seems so surreal. That entire week in Toronto, from flying in to flying out with the team is a time I won’t ever forget. Traveling to Edmonton this July was another great experience. I had dinner with the team and everyone had to introduce themselves and divulge one fun fact. Ryan Lindley revealed he was taking French lessons from JP Bolduc and after a quick demonstration of his surprising skill, the entire room filled with laughter. Any lowlights you want to mention? The ties. I always thought draws were a rarity in pro football, though I’ve experienced two in my two years with the team. Both versus Calgary and both at home openers (2016, 2017). They leave a bad taste in your mouth, but I guess they have been an integral part of building a rivalry with the Stampeders. Tell us about the OSEG social media strategy. Mat crafted these pillars to create a strong sense of community on our social channels and we as a team continue to live by them. We know RNation is the reason we’re so successful and we want them to feel appreciated, involved and excited to be a part of this community. My outlook has always been that content is king. Without great content who cares? It needs to be in context, engaging and timely. I’m also not afraid to be edgy. I like to banter with other teams, sometimes in other leagues. If I see an opportunity to create a conversation I usually pounce. 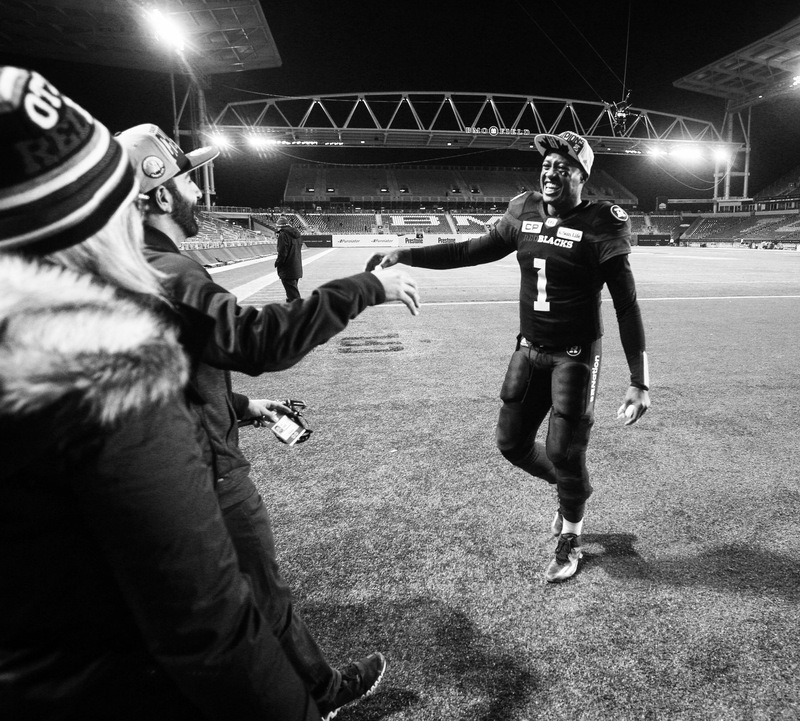 Engaging with RNation and showing them the appreciation they deserve is another focus of mine. Their continued support through the good times and the bad make my job the best in the league. QB Clubs and player Q&As seem to be very prevalent this year. What are some of your favourite initiatives? Anything fun on the horizon? I’m always looking to create more genuine fan experiences. Our players love interacting with fans in person and through different social media. Bringing those two sides together is an amazing feeling and creates lasting memories for both fans and players. How much trash talk actually happens. Even some of the league’s biggest stars participate and it can get nasty. Has to be the field. Walking across it after a game still gives me chills, whether it be with all the fans under the lights or pitch black with no one else in sight. Adidas took over as uniform manufacturer last year. Should we expect to see any 3rd/retro/heritage stuff this season? Not that I’ve heard, unfortunately. I was a big fan of the proposed plaid helmets though. Fingers crossed something like that comes along again. Oh, what might have been. Lol. This one’s tough, as I haven’t visited Calgary, Saskatchewan, or BC yet. So my choice would have to be Investors Group Field in Winnipeg. My first and only visit was for the 2015 Grey Cup. I volunteered to be Big Joe’s handler at the game and that turned out to be quite the experience. Love the new #RNation Twitter emoji. How did that come about? Who decided on the wood cookie? The #RNation emoji came about as a league-wide initiative. I was a part of the team that chose the wood cookie for the Redblacks. We thought it would be the perfect addition to the RNation hashtag, as we wanted to bring this essential part of our game day experience to the Twitterverse. Had a chance to play the new CFL Frenzy game? How do you like it? How do you think it benefits the league? I really like the CFL Frenzy game. I think from a marketing standpoint it’s a great endeavour by the league. It allows our fans to experience the game via a completely different medium. Instead of a passively watching the on-field action, they get to control the show. Making it mobile-only is another brilliant move. If it becomes extremely successful, maybe it can make to the jump to home gaming systems. It also attracts football fans that may not be familiar with the CFL. The average gamer has most likely only played NFL or NCAA football in the past. And I haven’t heard anything but positivity from the players. Who wouldn’t love becoming part of video game? I know I would! Find a way in and don’t stop working. Volunteer, intern, whatever you have to do. Just keep knockin’ at that door. No job is too small. From putting up posters in the restrooms to sorting through our photo archives, I’ve had many responsibilities at OSEG and every one is just as important as the next. First off I’d like to thank RNation. Working with such a great fan base every day makes my job one of the best in sports. If there’s anything you’d like to see more of, please feel free to let us know at @REDBLACKS or @tylerjrabb. Secondly, I’ve talked a lot about myself here, but obviously I get to work with a very talented group of people behind the scenes. Other members of our marketing team, our video production team, and our content and communications team all contribute to our social media in incredible ways. 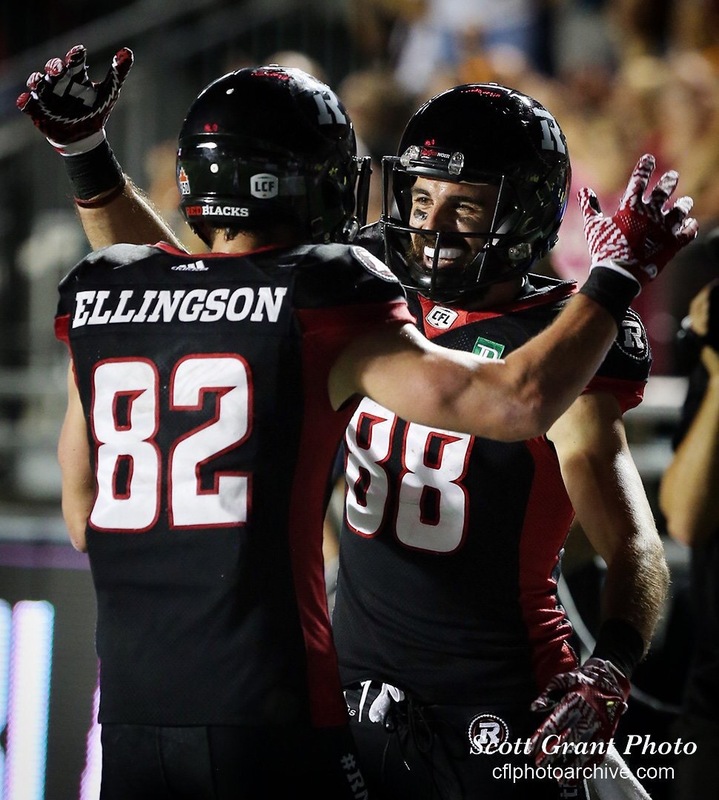 Thanks for your time and all the work you do to bring #RNation closer to the team, Tyler!